You can configure the display settings of volume data in Insight via the Volume tab in the Control Panel. 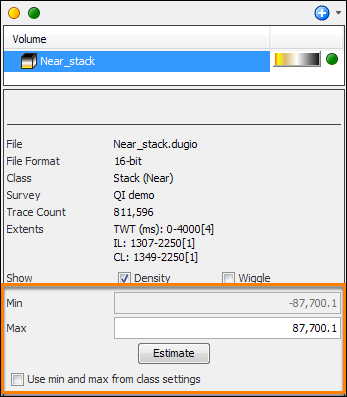 The Details Panel of a volume in the Volume tab has settings which affect the display of traces. These are controlled by the Class setting and the Show options. 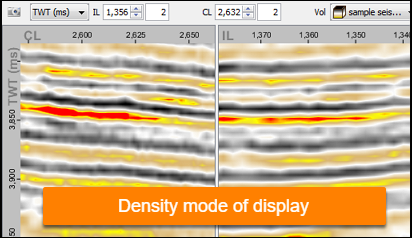 Select the Density check box to display trace data in the density mode using a colour look up table defined in the Class setting. When using the density mode to display the volume data, you can make minor adjustments to the colourbar. 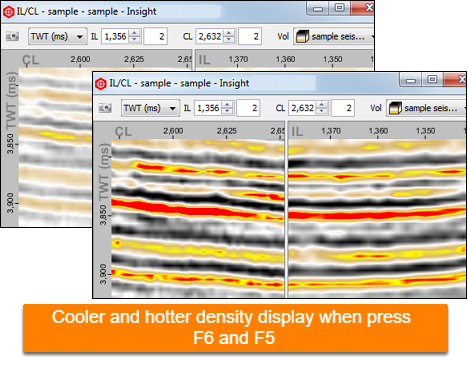 Pressing the F5 key one or more times compresses the range over which the colourbar is representative and has the effect of making the image look "hotter". Pressing the F6 key does the opposite and makes the image look "cooler". Pressing the F4 key once resets the colour map back to its default settings. You can also change the colourbar used to represent your data. Insight comes with a series of pre-installed colourbars. 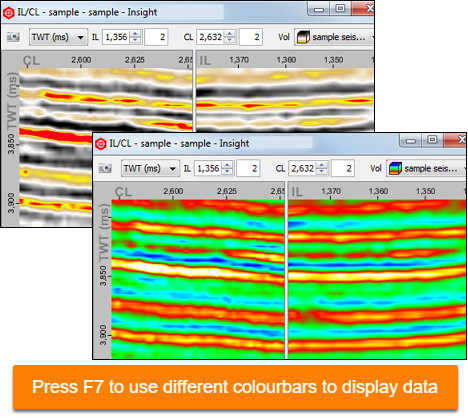 To quickly cycle through the available colourbars, press the F7 key. 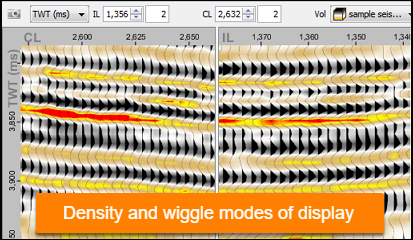 Select the Wiggle check box to display traditional wiggles in the section views. The settings for wiggles display are adjustable in the Class setting (see Defining Wiggle Settings). 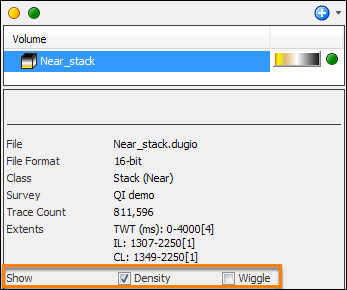 Tip: Select both the Density and Wiggle check boxes to display volume in density and wiggle modes at the same time. This feature allows you to use a common Class for most display settings, and override just the min/max for a volume. This is useful if you are opening two volumes of the same type but with different amplitudes. By altering the min and max clip of a volume, you will be able to view certain events in the traces clearer. When loading volumes, Insight will choose to use min/max from the class if it thinks there will be anything to see. Insight will estimate the range of the volume, and if that estimate is nothing like the class clip, it will choose to go with a per-volume clip. 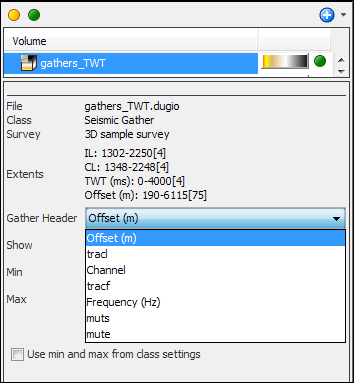 Select a volume to open its Details Panel. Clear the Use min and max from class settings check box. Enter values for Min and Max, or click Estimate and the system will automatically define a reasonable default. Note: If the class is symmetric, the Min field is disabled and automatically set to the negative Max value. For gather volumes, you can specify the Gather Header from the Details Panel. Available options are Offset (m), tracl, Channel, tracf, Frequency (Hz), muts and mute.